As Ryan Skinner, Upstate Regional Business Development Specialist and Felicia Johnson, Interim Commissioner observe, Dr. Roxzanne Breland, Agency Board Chair, demonstrates package assembly at VR’s new Training Center located at the Bryant Center in Lyman. 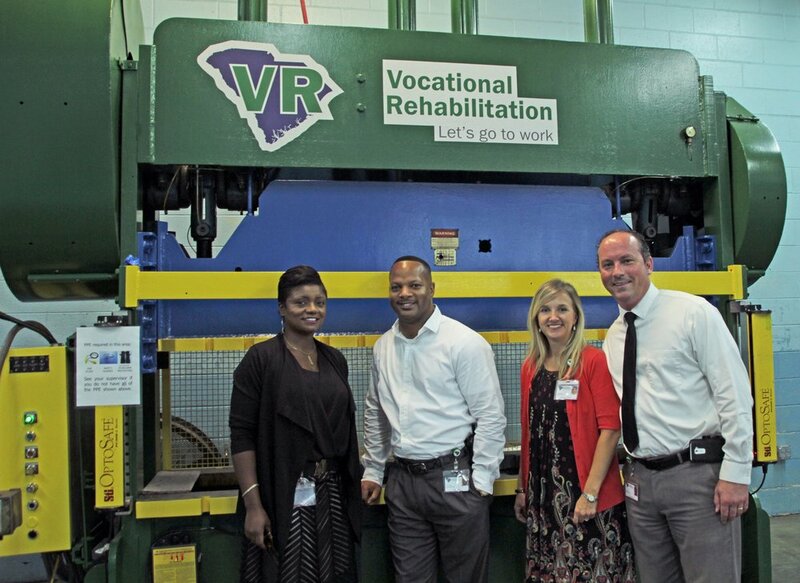 Felicia Johnson, Interim Commissioner; Tim Geter, Training Center Manager; Cole Gallman, Spartanburg Area Supervisor; and Ryan Skinner, Upstate Regional BDS, showcase the press punch machine that will be used to provide demand driven training to VR clients. Real and simulated inbound calls are received by VR clients at the Bryant Center in Lyman as part of the training initiative with BPO American. Jennie Thomas, Area Administrator; Dr. Roxzanne Breland, Agency Board Chair; Ryan Skinner Upstate Regional BDS; and Jayhue Weisner, Bryant Center Training Center Manager, watch as Interim Commissioner Felicia Johnson receives hands-on training in Sloan Construction’s heavy equipment simulator.